There's nothing more impressive than a grown man completely making himself over, whether it's the bumbling Hugh Laurie reinventing himself as a gruff American super-doc, or the slightly less bumbling Stephen Fry reinventing himself as someone who might actually pass medical school. Undergoing an alcoholic metamorphosis, the new Bodeans, launching today. In order to not keep up with the times, this fast-casual Tower Hill resto has converted itself into a southern American-style bar where vintage US whiskey & meat ads adorn wooden walls, old school beer trays hover over the bar, and an ESPN-tuned plasma's flanked by two massive steer skulls, one the former property of Lt Col Oliver North -- willing scapegoat for Reagan's Iran/Contra scandal, Fox News pundit, and the only man besides "Dan" to ever be popularly associated with the "lieutenant" rank. Thematically wondrous bourbon cocktails run from small-batch Manhattans and Old Fashioneds to the "Kentucky Root Beer Float", with Heaven Hill bourbon plus vanilla liqueur, Goose Island root beer, and vanilla ice cream; further mixed intox includes the "Bodeans Martini" (regular/citrus/pepper vodka and vermouth in a paprika-rimmed glass w/ "fire kissed" Gamba shrimp garnish) and the Calvados/apple schnapps-addled "Mom's Apple Pie" -- because if anything's American, it's Spain and Germany moving to the same place to eat too much. The cross-pond beer selection boasts six varieties of Sierra Nevada and two Anchor Steams/Goose Islands/Dogfishheads/Brooklyns, plus Lonestar, Dixie, Sam Adams, Blue Moon, and Moosehead; for the hard brown stuff, there's Evan Williams honey-infused bourbon and Platte Valley corn whiskey, plus jars of Georgia Moon, Johnny Drum, and candied-orange infused Jacquin's Rock & Rye -- which unlike Joaquin's, won't put hair on your chest face. 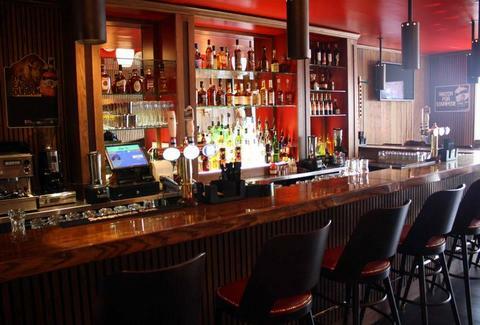 For nourishment, drinkers can sit down for Bodeans regular bbq fare, along with bar snacks such as mini burgers, soft shell tacos, and dollar rolls stuffed with the likes of pulled pork and burnt ends -- a condition hardly worth the attention of House, no matter how Fried they are.